Born in 1929, Ray competed as a junior with Coburg Harriers and quickly broke through into the top senior ranks with the silver medal at the 1949 Australian track titles at only 20 years of age. From then on, he was a regular placegetter in the major championships, showing talent over all distances. Ray joined the famous Cerutty group at Portsea in 1953 and was advised by him for the remainder of his career. 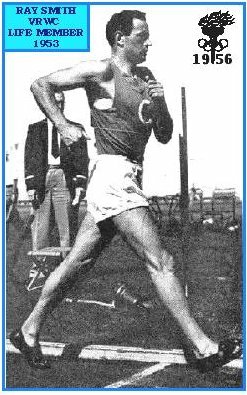 In 1954 he decided to train for the 1956 Olympic 50 km event and started what was for him his most important walking period. This culminated with his top walking performances in the 1955-56 timeframe. The 1955/56 Australian rankings saw him head the the 20 km walk lists (99:24). He won the 1956 Australian 50km which was also the Olympic trial (4:40:24). This was his first race over the distance and broke the Australian record. This gained selection, with Crawford and Allsopp, in the 50km for the 1956 Olympic Games where he finished sixth (4:56:08) a few months later. This was his second and last race over the distance. Soon after this, Ray retired from serious competition and threw himself into the sport as an official, administrator and judge. This culminated in his appointment as an IAAF judge. 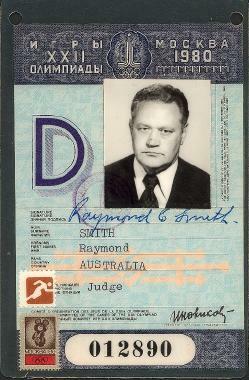 In this capacity, he officiated at many international meetings in the 1980s and the 1990s. His list of non-competitive achievements in the sport shows just how much he has contributed on various levels. Officiated as walk judge in all states of Australia, ACT and Northern Territory. Officiated as walk judge in the following countries - Australia, China, England, Germany, Isle of Mann, Italy, Korea, New Zealand, Scotland, Singapore, Spain, Sweden, USA and former USSR. Ray remained active in the Victorian Race Walking Club throughout his later years, judging there regularly until he eventually decided to hang up the paddles in 2006. At the same time, he finally stopped producing his weekly VRWC news bulletin on race days and retired from his position as club communications office. But Ray was never one to sit back quietly so he simply moved to the video camera, experimenting as he went, and producing high quality weekly videos of all VRWC races right up till the end of the 2009 winter season. He was in his element sitting in the clubrooms the next week and explaining to the intricacies of the walking technique and how each could improve his/her style. 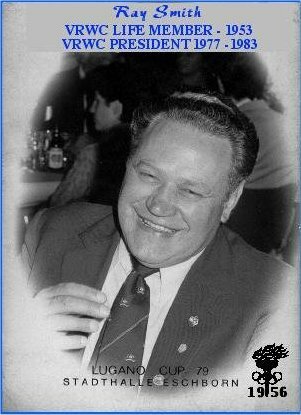 His knowledge of the sport was encyclopedic and his enthusiasm never slowed with the passing years. This willingness to ‘put in’ made him a highly valued member of the VRWC Committee and the club and we shall all miss him greatly. Ray died on Friday 4th June 2010, aged 80. He remained healthy, involved and interested in all things athletic until the end.